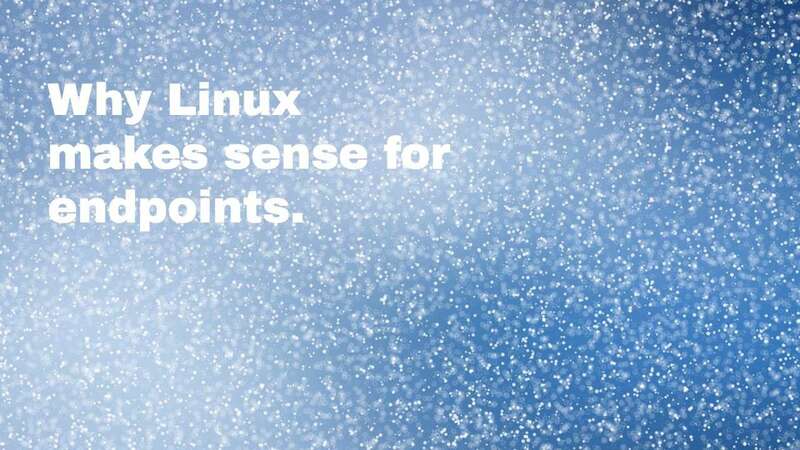 When you need to manage thousands of endpoint devices and need to do it with as few full time employees as possible, you may want to consider a Linux based OS. Our Mike Matchett chats w. Igel's Jed Ayres about linux for endpoints and end user computing. Check out the transcript or full video below. Yeah well I mean I think at the sort of core of IGEL the simplest way to think about IGEL is we have a purpose-built Linux operating system that, for delivery of applications in desktops from the Cloud or Citrix or VMware and that operating system is a 64 bit read-only operating system that's used to a management console that really allows an IT Administrator to manage tens of thousands of devices very effectively. - And some of these, yeah, you start talking about Linux and speeds and feeds we start to think complications in subtleties but when we look at the story of what you guys are doing it's really about simplification and rock-solid endpoints right? 'Cause people have problems up, you know, Windows, I just say Windows 10 and people start to shutter, right, and that's what most of these things running most people's experiences are and they're calling the support and help desk left and right and very expensive but when you guys come in and put this piece in, your Linux connector and your versions of hardware, right, things just get very simple and straightforward and easy? - Absolutely, yes. So we're really disrupting the market and the beginning of that disruption actually starts with the capacity to take that really thin, light, secure operating system, which by the way, it's in its sixth generation, right, so really sturdy piece of technology. We have the ability to sort of take that and convert existing x86 infrastructure, right? So people tend to be sitting on pretty robust hardware and many of these large organizations think they have to refresh it for Windows 10, right, to meet the spec of Windows 10 and be part of that refresh and what we're seeing is Windows 10 is the biggest driver in our business today because one, it's a management headache and two, there's a hardware, you know, cost. And what happens is with IGEL we come in and basically say, no, put this converter software on those devices at a fraction of the cost of replacing them and you're gonna have much easier management, it's historic. We have people managing 30,000 devices with less then one head count. You're gonna have a much more secure posture, this is a 1.2 gig operating system, read-only, you know it's never been breached so it's like a very, very secure operating system and then you sort of add the three things up, right? You've got a capital savings, an operational savings, and a security story and then the whole thing is really brought to life by an innovation engine, right? We have a hundred engineers in Germany that are just iterating on this, these two things, right, the operating system and that management console. - So we talk, I mean you mentioned the CapEx savings and that's a big chunk. What are benefits of Linux Endpoints for Healthcare Use Cases? Really one of the keys here is that this can provide you a consistent environment on many different kinds of XA6 devices and so on and even into a Cloud environment running Linux and so unlike some other solutions I can get the same environment everywhere including repurposing my existing hardware if I've already deployed that for endpoints, right? - I mean that's where we're really seeing a lot of interest today is that you have say a big hospital, I mean obviously hospitals are acquiring other hospitals, not only do they have sort of aging thin clients that may not be able to connect to Citrix or VMware in the right capacity but then they also have a whole lot of tablets and desktops and laptops and we put this operating system on those devices and we breath new life into them. In many cases we can make collaboration technology work that didn't work before, we can make wireless connections more stable and more better. We can obviously add a whole bunch of security parameters to that machine and in many cases we can actually make it work faster, use less battery life, all these things are highly important to driving a good user experience and a great management experience. I mean I'll give you one antidote. We have a higher education customer, Ayrshire College, it's actually in Scotland, they were about to throw away thousands of HP Laptops, they were getting less than an hour of battery life. You put IGEL operating system on them they go from one hour to seven hours, better then they were out of the box brand new. So that just sort of shows you some of the power of a light, sort of thin, operating system applied to hardware that running Windows would be thrown in the garbage. - Yeah, I mean I've certainly got a box in the corner of stuff I'd like to put this on and revitalize,give it all to my kids. So you definitely got that savings up front. You just briefly mentioned the low support overhead. I know we've talked before and you threw out an example, could you just tell me what that example is, 'cause you know if you were supporting 30,000 Window's desktops it's gotta be 50, 60 people, maybe 100 people for that support-- - Yeah. - What are your experiences with this? - Yeah so our favorite story to tell around this and actually somebody who will be with us is a lady who ran IT for Luxottica, which a lot of people don't know this name but I'm sure your listeners are familiar with Sunglasses Hut or Pearle vision, or LensCrafters, the largest LensCrafter kind of company in the world, they have in North America about 30,000 endpoints, 5,000 retail stores, those are managed by less then one head count. So you can imagine that is just an impossible metric and those are devices by the way in retail stores where you don't have any smart IT people, right, and these are devices that are connected to the cash register. And over the decade long relationship we've had with them and all the operating system patches that we send to them, every 12 weeks IGEL sends a new operating system update, we've never bricked a system. And you know obviously I'm sure there's listeners that are watching that know Windows 10 that's one of the biggest challenges today is we see hospitals and executives that are getting blue screen as they randomly get an update for Windows 10 on their device. - You know I'd like to meet the less than one person that's managing that find out what else he does for this. But you brought up an important point... - It's about redeploying that guy too, right? He's gonna lose his job but there's obviously a lot better hired better use for an employee then patching and managing Windows. - Well certainly the hundred of them, right, that don't have to sit there. You mentioned a couple times in passing, security, and I know that's a really big thing and IGEL's been really popular over the years in healthcare because of the things you're talking about but also security and making sure things work. So there's a robustness angle to this, it is we're just talking about, but you put all those three things together so they can get all their devices, they can do it cost effectively, they can operate them with minimal staff and IT, but then they can secure it. So tell me just a little bit about the security angle and what you guys do there for like the random stuff that gets plugged in all over the place-- - Yeah so, you know IGEL, one of the magical things about IGEL is that we maintain an ecosystem that's built into that operating system of over 60 different pieces of technology, right? So whether it's analytics, or security, or printers, or collaboration technologies, there's this, and obviously Citrix and VMware and 15 other protocols also work which is kind of an amazing thing, right, when you're talking about a 1.2 gigabyte operating system to have all of those solutions baked into the operating system and functional out of the box, it's a remarkable thing. And then obviously there's a capacity to manage that, all the new releases coming from those 60 different alliance partners is also a big deal. So yeah, that's something I think, security is, you know we wake up and think about security. Linux inherent in the way that the operating system is built, we believe it's more secure but we're working with companies like deviceTRUST that do some very interesting things with contextual security. We're working with Cherry keyboard where they can actually encrypt from the keyboard to the Citrix or VMware session, so keyloggers are not a problem. We obviously have a lot of good relationships with Single Sign-On companies like Imprivata especially in the healthcare related dominie. So yeah, there's some great integrations and security is, I think about it in three pillars, right, it's the CapEx savings, the OPEX savings, it's the security, but the whole thing is really underpinned by a hundred software engineers in Germany that are iterating on this piece of software. - And you guys, we're running towards the end of the time slot we have here, I mean you guys are as we looked at some market forecasts where goes and gets the reports from the bigger Tier 1 house firms, they're seeing you now show up and threatening the major thin client players, the major big players there, you guys are, really made a big splash in the last couple years which is tremendous to see. When I think futures, and I look at what you guys are doing, Linux, the small OS stuff, I think IoT. Maybe you could just finish with a little bit about kind of this vision for IGEL in the future. - Yeah, so I would tell you obviously as you start to think about IoT and billions of devices connected to the internet, that's obviously a very fascinating total addressable market, right, especially for a company that's got two decades plus of building a small Linux operating system. The tricky thing for us is today our operating system really solely works on x86 and so we're working obviously very hard in our R&D Labs to basically give that same kind of performance but on a ARM chip right, because as we move to this world of billions of devices we don't believe it's gonna be on x86, right, it's gonna be ARM and in many cases it will be chips that are more inanimate in terms of, they won't have a human sitting there right. It'll be like thermostats and-- - I was gonna say I can't wait to have an IGEL in my frigerator and my coffeepot and get my work done while I'm pouring my coffee. - Right well certainly you don't wanna have a blue screen when you're pouring coffee, right? So one of the things we see which is very encouraging, right, is that the biggest players in the sort of wind-tail juggernaut, namely Microsoft and Intel, in the last 90 days in fact have come out with their own Linux distributions, right? So Microsoft has Sphere which is Azure Sphere which is, in January of this year they announced that, that's their Linux distribution and then in May you say Clear Linux from Intel which is their distribution so we definitely believe we're sitting on a really special piece of IP that will have a very important role to play in this world with billions of devices. - Yeah and I didn't mean to be facetious about that. And we talk healthcare's got all sorts of devices that are really critical and important that aren't necessarily-- - Right. - In standard form factors and things like that. Okay so, we've kind of run out of time. There's tons to talk about with you guys. Just finish up telling me where if someone wants to look at IGEL, kick the tires, have a discussion, your website, anything else they should do? - Yeah, well I mean the most amazing thing about IGEL is you can go download three licenses and covert a device right off our website. So take one of these old devices you have sitting around and put our OS on it, join the IGEL community. We've got a very vibrant community headed up by Doug Brown, over a thousand people on Slack that are talking about how our technology can revolutionize your environment. And then we'll have our own event, actually we're partnering at NVIDIA in February in Silicon Valley at their new headquarters which if you haven't Goggled the new NVIDIA headquarters it's like walking into the future, so we will be hosting an event there in February. So some of the sort of exciting product announcements and the future of IGEL will be on display there at the event. - Alright, well I think that's all the time we have today. Jed I appreciate you being here. Thanks, thanks for being on the show and explaining some of the stuff. - Awesome, thank you for having me Mike. I love this kind of interview. - And thank you for watching. We're gonna be back with some more end user computing coverage on this channel, take care and see you soon, bye. - Thanks Mike.